Set your browser window to wide and let loose the bandwidth: here's an image-heavy articleon some painted miniature soldiers.This article shows some 6 mm Baccus miniaturesto depict the Carthaginian army for battling the Republican Roman duringthe Punic War, using Richard Borg's board gameCommands and Colors Ancients.Other good sites for information on this great game areJohn Foley's CCA site,Board Game Geek's CCA pages,and the Yahoo CCA Vassal group.The game is played on a hex board which are created here withGHQ Terrain Maker terrain hexes.This article is a follow on the a preview article written back in March of 2006. The banner image at the top of the page shows a panorama of the Carthaginianarmy at the Battle of Zama in 202 B.C.This is a famous battle of the Punic War in which the Roman general Scipiofinally defeated Hannibal and Hasrubal and forced their culture into decline.The Carthaginian economy was destroyed, the field were salted, and arguablyNorth Africa has been reeling from this defeat ever since. 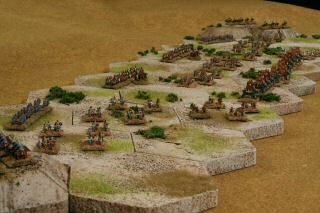 The next photo shows a close up of the elephants at the start of the battle.And the photo at right shows the view from the Carthaginian read near the light horseson the left.Unfortunately, I am only midway through making GHQ terrain hexes, so these are all thecompleted hexes I have for the photo, and hence the hills at the back corners.The complete game board is 13 hexes wide by 9 hexes deep, so with these 4 inch (10 cm)hexes (measured flat side to opposite side), the complete board will be 52 inches (130 cm) wideby 36 inches (90 cm) deep. Here are 3 stands of Carthaginian leaders, 3 figures per base.These are based on 20 mm circular bases to distinguish them from the regular army.Like all the bases, there is some textured spackle paintedVallejo Desert Yellow. Then some Woodland Scenics burnt green grass togive it that dry desert look.The figures are Baccus AIR6. Here are 16 stands of light infantry, 4 figures per base.The bases are 20 mm square steel from Wargames Accessories.They sit atop a 40 mm square thin plywood from Litko Aerosystemswith some self adhesive flexible magnet.Since CCA has 4 infantry stands per unit, the magnetic base helpsmove 4 stands rather quickly.These figures are Baccus AMO1. Here are 16 stands of slingers, 4 figures per base.In CCA slingers and bows can fire a long range of 3 hexes.There is no difference between slingers and bows in the game.These figures are Baccus ASP3. Here are 20 stands of auxilia, 6 figures per base.They have that Celtic shield as they are probably alliesthat Carthage enlisted in Spain or Gaul.The figures are Baccus ASP1. 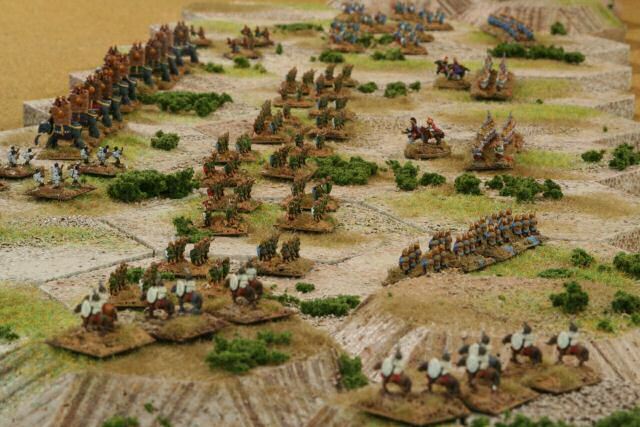 These figures are 12 stands of warriors, 6 figures per base.It is tough to see from the photo, but they are staggeredin a loose order.You cannot see it in the photos, but the infantry havepainted green circles, blue triangles, and red squares tohelp identify them.They are also distinguished by the number of figures per base.These figures are Baccus ASP2. Here are 12 stands of medium infantry with nice matching blue oval shields.The density is starting to look formidable.These guys are packed 6 to a base.The figures are Baccus ACA1. 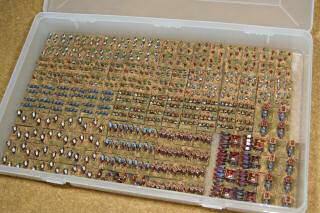 These are 16 stands of heavy infantry packed 8 to a base.They completely fill the 20 mm base edge to edge.These are Carthaginian African infantry which were likelymodeled on successful Greek armies of the time.Imagine being a fierce warrior and trying to breech this tight formation!These figures are Baccus ACA2. 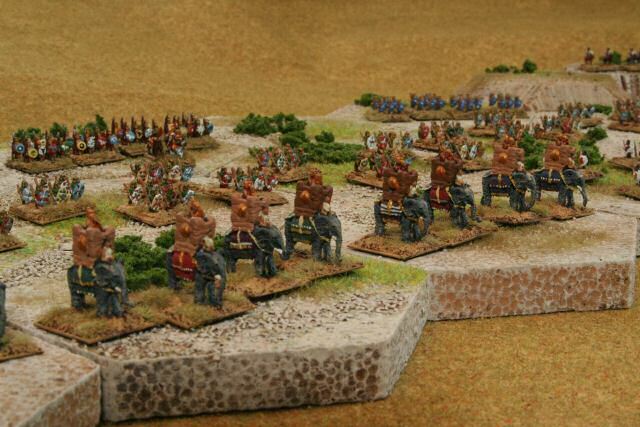 These are 24 stands of light cavalry, 2 figures per base.Like the infantry, they are each on 20 mm square bases,but in CCA there are 3 stands per unit, so these standsare magnetically attached to a 60 by 20 mm rectangular base.These Numidian figures are Baccus AMO3. Here are 9 stands of medium cavalry, 3 figures per base.These Carthaginian allies are Spanish cavalry,allied to Africa and vowing to destroy the Romans.These figures are Baccus ASP5. Here is a deadly wall of 12 stands of heavy cavalry, 4 figures per base.The figures are packed tight from edge to edge of the base.The figures are Baccus ACA3. Here are 4 stands stands of chariots, 2 chariots per stand.Although few CCA scenarios have Carthaginian chariots,these guys are certainly reusable as Persian or Greek units.In fact, these figures are Baccus "Persian Chariots" APE15.I painted them as brightly and awe-inspiring as possible. Ialso put 2 to a base to make them seem a little more formidablefor the games. Finally, you either must be very bored, at work, or you really wantto see the Carthaginian elephants!Here are 6 units of elephants, 2 pachyderms per base.Although the current CCA scenarios only uses 6 stands at most,you certainly want to have more elephants for design-your-ownscenarios, and for making the elephants very imposing.Elephants are very enjoyable and random in CCA.Eighty percent of the time, they do some random damageand then give a banner to your enemy as they are destroyed.However, 10 percent of the time they are deadly to you enemy,and the other 10 percent of the time, they are deadly to you!So here are a total of 12 figures from Baccus ACA4. Here is another view of the Battle of Zama.As you can just make out, the elephants are forward and center.The generals Hannibal and Hasrubal are in the center rear withtheir heavy infantry.Auxilia form the middle line.And all sorts of horse and flingers are on the flanks.Can you stomp the Republican Romans with this force? Here's a view of the army, nicely stowed away in a 13.75 by 8.5 inch (35 by 22 cm)tackle box.It is just by luck that every stand fits in one standard size box.Sheesh, here you are looking at nearly 3 months of hobby time.I hope I don't drop it or back a steamroller over it. Thanks for visiting and reading about my Commands and Colors Ancients figures.Next step will be the Republican Romans, and then it is on to theGreeks and Persians for the expansion set.Thank you Baccus for making such a great range of ancient 6 mm figures.If you have a similar set of CCA figures, I would be interested in seeingyour version and the ideas you used to make the game.More miniatures-related articles are atDan Becker's Miniatures and Models site. Last modified: Thursday, 09-Jun-2011 12:54:29 MST.